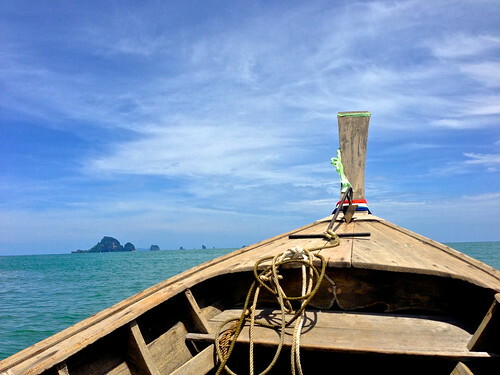 When we first started “planning” (in quotes because we didn’t do so much of that whole planning thing) our RTW trip one thing we knew for sure was that we wanted to go to Thailand. 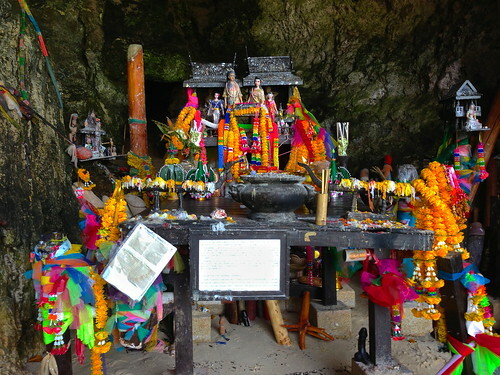 Every blogger and travel site has tons of pictures, sites to see, stories, and an array of information about Thailand. It’s definitely on the backpackers trail not only because of it’s beauty, but because it’s so dang cheap! 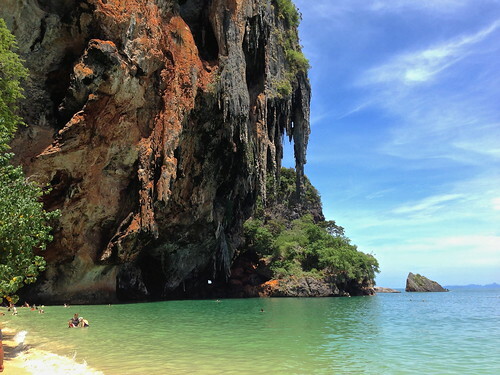 Cheap + beautiful beaches = it’s on our travel wish list. No longer is it in the wish list category because we have travelled our way through Thailand starting in southern Thailand and its islands. We’ve been in landlocked Chiang Mai for almost a month now, cutting ourselves off cold turkey from our addiction to the beaches of Thailand. 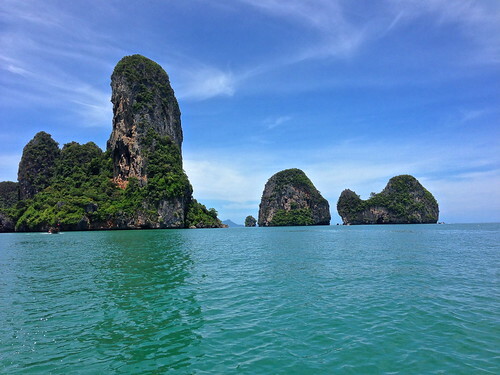 So when I started looking through pictures I wanted to share with you I immediately looked up how much it would cost to head to Krabi for the weekend. Luckily for Greg’s wallet I came to my senses when I realized it’s actually quite pricey because of the last minuteness of my craving for beaches. So instead, I’m just going to have to get my beach fix from all our pictures. 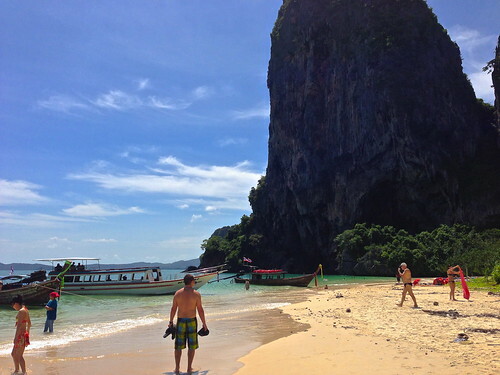 Today we begin with my favorite beach of all time in the whole wide world, Phra Nang Beach. 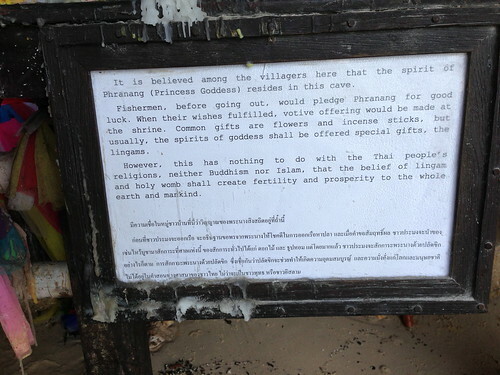 Only accessible by boat because of its high cliff-sides. 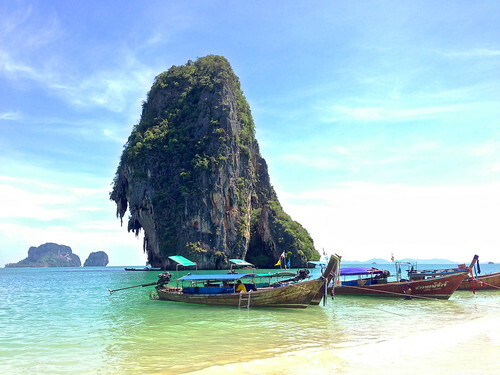 For 100 Baht each ($3.20) we long-tailed roundtrip from Ao Nang (a province of Krabi, Thailand) to this little slice of heaven. If you’re looking to get your speedo on, I highly recommend this beach. 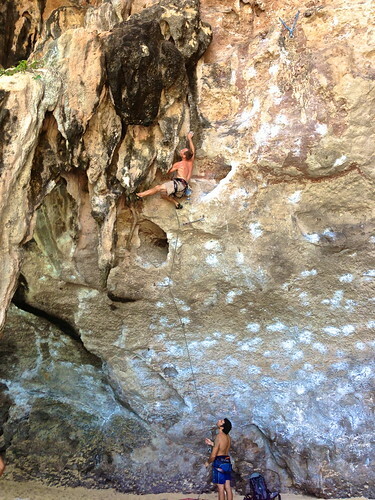 Rock climbing is another popular activity on this limestone enclosed beach. 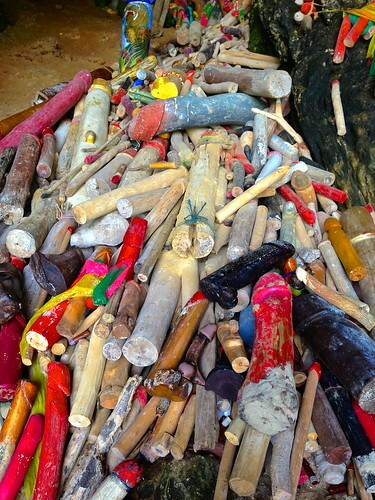 You can also check out this fertility cave that had some interesting offerrings inside (Sister, close your eyes!). But we chose to swim and layout in the sun and stare at all the beauty surrounding us. 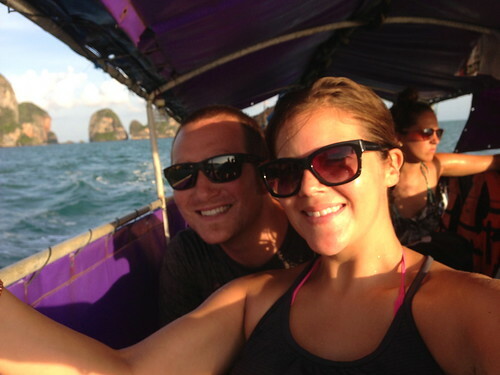 Then it was time to hop back on our long-tail boat and take selfies. 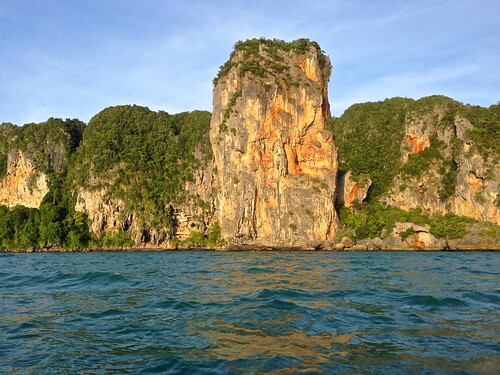 And pass by even more limestone cliff-sides. 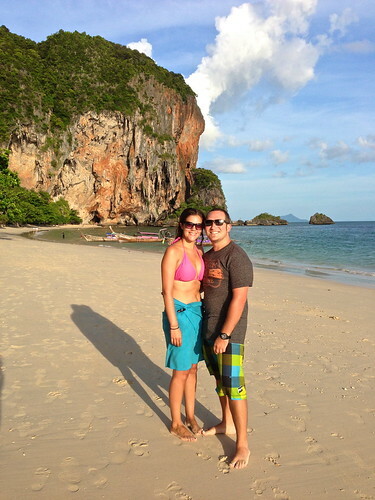 Get ready for more beachy goodness because we still have more to cover in Ao Nang, Koh Samui, and Koh Tao. I’m generally not much of a beach person, for me when I think of beach it usually equals very crowded beaches with loud people screaming and running around or playing loud music. Not particularly relaxing if you ask me. 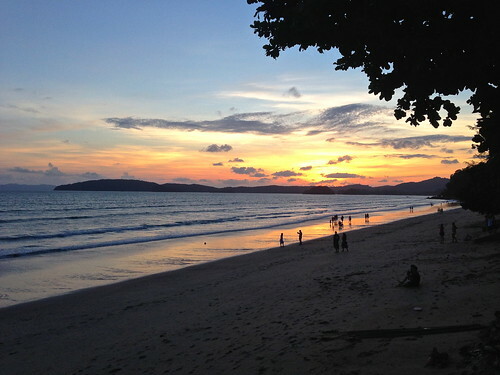 But these beaches look so beautiful and serene I’m pretty sure I could spend some time there if I ever got the chance. UGH. It’s SO PRETTY AND AMAZING. yes, it’s definitely a good place to relax. We tucked ourselves under a tree for shade and enjoyed the view and read books for hours.